A man pushes a cart while shopping at a Walmart store in North Bergen, N.J.
Walmart Inc. posted its best quarterly U.S. sales growth in a decade and upped full-year sales and profit outlooks on Thursday, sending shares surging as a jump in online and grocery purchases showed the company can hold its own against Amazon.com Inc. The world’s largest retailer is known for its sprawling stores, a factor that could have worked against it as shoppers migrate online. But Walmart is also the top U.S. grocer, providing a lure for customers to visit stores where they may also make other impulse buys. 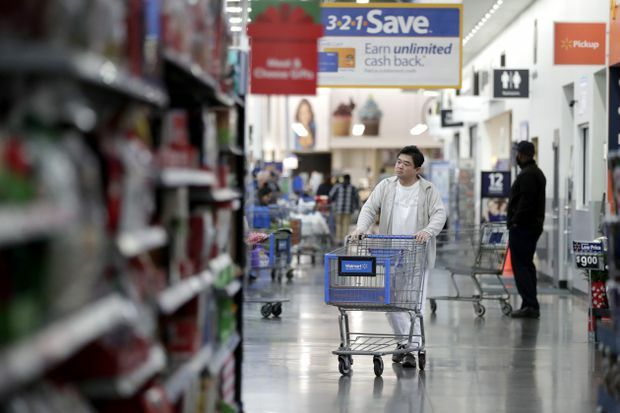 Consumers spent more on categories such as grocery, apparel and seasonal merchandise in the second quarter, helping sales rebound after a slow start in April. Walmart has recorded four straight years of U.S. growth, unmatched by any other retailer. “We saw strong performance in fresh food,” U.S. chief executive Greg Foran said on an earnings conference call, praising sales in produce, meat and bakery. Grocery sales rose to their highest in nine years. Walmart benefited from improved weather in May, the first month of the quarter, seeing the biggest quarterly gain in customer traffic in more than six years, chief financial officer Brett Biggs said. “[This] is a reflection of Walmart’s various in-store and online initiatives, and likely an indication of solid market share gains, and an overall healthy consumer backdrop,” Credit Suisse analysts said in a note. Sales growth has come at some cost, however, with the company citing continued margin pressures driven by cutting prices, higher freight costs owing to a shortage of truck drivers and e-commerce investments. Walmart’s shares were up 10 per cent at US$99.08. The company’s stock had fallen around 9 per cent since the start of the year. E-commerce sales grew 40 per cent in the quarter, up from 33-per-cent growth in the previous period, and the retailer said U.S. online sales are on track to rise 40 per cent for the full year. Walmart now offers curbside pickup of online grocery orders in 1,800 U.S. stores, and the service is bringing in new customers, Mr. Biggs said. A sharp slowdown in online sales during the crucial holiday months had spooked investors, who worried the retailer would not be able to keep pace with Amazon. Cowen & Co estimates that 86 per cent of Walmart shoppers also shop on Amazon. International sales were up 3.1 per cent at US$29.2-billion on a constant currency basis, helped by strong comparable sales in Mexico, Britain, Canada and China. Separately, Asda Stores Ltd., Walmart’s British supermarket arm, reported a 2.6-per-cent rise in quarterly sales on Thursday, ahead of an expected takeover by bigger rival Sainsbury’s. In June, Walmart sold an 80-per-cent stake in its Brazilian operations to private-equity firm Advent International. It paid US$16-billion for a majority stake in Flipkart. Sales at U.S. stores open at least a year rose 4.5 per cent, excluding fuel price fluctuations, higher than analyst forecasts of 2.38 per cent, according to Thomson Reuters I/B/E/S. Excluding one-time items such as a loss related to the sale of a majority stake in Walmart Brazil, Walmart earned US$1.29 a share, ahead of analysts’ expectations of US$1.22 a share. Total revenue increased 3.8 per cent to US$128-billion, beating estimates of US$125.97-billion. For the full year, Walmart expects to earn between US$4.90 and US$5.05 a share, up from a range of US$4.75 to US$5 a share. The retailer said same-store sales in the United States should rise about 3 per cent in fiscal 2019, up from a prior target of at least 2 per cent.